Place zucchini directly on oven rack near the bottom. Cook until slightly softened, 5 to 10 minutes. Place bacon slices on paper towels. Heat in microwave on High until cooked but not crisp, about 3 minutes. Place a layer of bacon on each zucchini slice; top with a slice of fontina cheese. Tightly roll each layered zucchini strip and secure with a toothpick or skewer. Place on baking sheet. 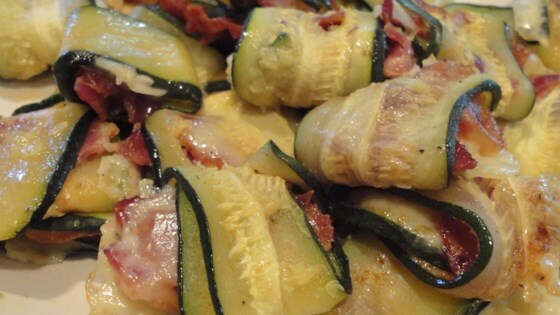 Bake zucchini rolls in the preheated oven until cheese is melted, about 10 minutes. delicious...added fresh grated garlic and baby bella sliced mushrooms and it was perfection.